Chipotle says sales recovering, but down 26 percent in Feb.
Chipotle says sales were down 26 percent for February and that it expects to report a loss for the first quarter as it works to recover from a series of food scares. NEW YORK (AP) — Chipotle says sales were down 26 percent for February and that it expects to report a loss for the first quarter as it works to recover from a series of food scares. That would mark the first quarterly loss for the Denver company since it went public in 2006. The company had previously said it expected its per-share results to be "around break even" for the period, after taking into account higher costs for marketing, promotions and tightened food safety to win back customers. The drop in sales for February at established locations follows a 36 percent decline for January. The February results were boosted by the extra day in month this year, the company said. Sales at established locations, or those open at least 13 months, are seen as an important gauge of financial health because they remove the volatility of newly opened and closed locations. 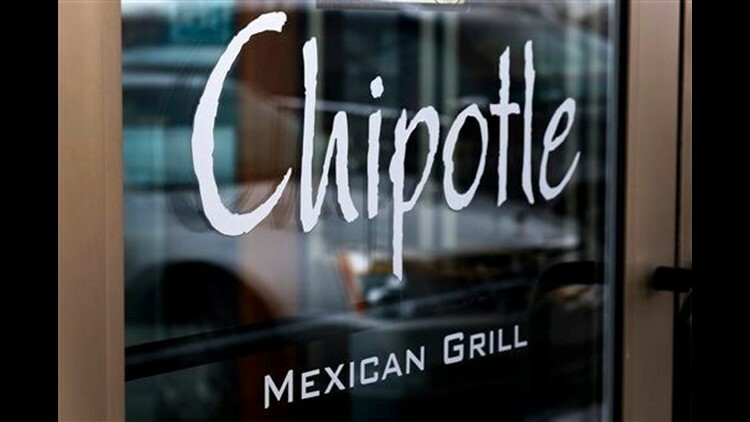 Chipotle Mexican Grill Inc. is trying to bounce back after an E. coli outbreak and other incidents sent sales plummeting starting at the end of October. Executive have since said they've taken steps to ensure food safety and that the incidents are behind them. To get customers back in stores, the chain known for its burritos and bowls is being more aggressive with marketing and promotions. The company said its sales recovery began the week of Feb. 8, when it offered people a chance to get coupons for free burritos on their mobile phones. It said the recovery continued into March, with its sales decline easing to 22 percent for the first week of the month. But in the second week of March, a restaurant in the Boston area was temporarily closed after workers were reported to be sick. No customers were sickened in association, the company said. But it proved to be a setback in the chain's recovery, with the sales decline deepening to 27 percent. Credit Suisse analyst Jason West has noted Chipotle's promotions for free entrees is likely bringing back many customers into stores, but could also be eating into sales from people who were still going to the restaurants anyway. In addition to the Feb. 8 offer, West cited a direct mail campaign offering free entrees that expires May 1. In its filing with the Securities and Exchange Commission Tuesday, Chipotle said its first-quarter results would include an estimate of the "liability for expected, but unredeemed free burrito offers." The company also said it expects to incur higher legal costs in relation with an investigation by the Department of Justice. A representative for the office in California has declined to comment on the case. For the first quarter, Chipotle said it expects to report a loss of $1 per share or more. Analysts surveyed by FactSet forecast a profit of 3 cents per share, on average. In the year-ago quarter, the company reported a profit of $3.88 per share. Chipotle also said Tuesday that it has hired James Marsden, a previous faculty member at Kansas State University's Animal Science and Industry Department, as its executive director of food safety. A spokesman for Chipotle confirmed that Marsden is also the father of the actor of the same name. In after-hours trading, shares of the company slid more than 3 percent to $485.98.